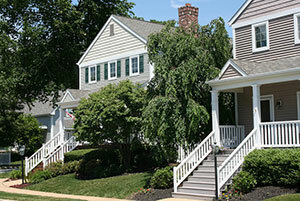 Housing Diversity refers to the range of housing options available to residents of Chester County and other areas. Each municipality is required by the Pennsylvania Municipalities Planning Code to provide opportunities for all types of housing through their zoning ordinances. Offering a diverse mix of housing, in cost, unit types, and neighborhood settings is important to meet the needs and preferences of all residents. Closely related to housing diversity is housing affordability. There is a significant shortage of affordable housing in many municipalities in Chester County. The shortage is particularly prevalent in suburban municipalities where new residential construction tends to consist of large, detached single-family units offered at prices out of reach for moderate-income families. Furthermore, low-income households, i.e., those earning less than 50 percent of the area median, tend to have the most severe housing affordability problems. Housing diversity is also related to housing accessibility. Housing accessibility is a very important consideration for the elderly as well as for other individuals with disabilities. New construction housing should meet the standards, at a minimum, for visitability, or ideally be fully compliant with the Americans with Disabilities Act. In addition, for seniors who prefer to age-in-place, accessibility modifications to the home may increase the ability of these residents to stay in their neighborhoods longer and delay the move to congregate housing. 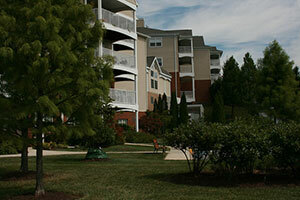 Jenner's Pond in Penn Township includes housing opportunities for seniors. Economic Stability: Housing that is affordable to the workforce is critical to the local economy, and directly impacts the ability of employers to recruit and retain staff. Businesses, commercial establishments, school districts, universities, and municipal governments that employ workers at moderate-income levels will benefit from more diverse housing choices. Commuting and Traffic Advantages:a The shortage of affordable housing causes young professionals and families to locate in outlying areas, requiring lengthy commutes to and from their jobs. Transportation costs and traffic congestion can be reduced when diverse housing options, close to employment centers, are provided. Accommodating our Aging Population: The growing population of seniors living longer, healthier lives, suggests that demands for diverse housing options will increase. Housing that addresses the spectrum of income levels and lifestyle choices or limitations will allow seniors to remain in their homes and contribute to their local communities. Sustaining Families: Diverse, affordable housing is critically important to the health and well being of children and families. When housing needs are appropriately met, children are more likely to be healthy and perform well in school, and parents are more likely to be productive members of a strong workforce. Community Opposition: The municipality may need to address community resistance that is sometimes encountered when providing for "affordable housing". Inadequate Ordinances: Regulatory barriers within municipal regulations (such as standards that favor large-lot, single-family subdivisions) will need to be reconsidered. Inadequate Density: To achieve housing diversity, municipalities may need to increase permitted residential densities within their zoning ordinances. Market Resistance: In Chester County, the market for large suburban single family homes has, for many years, been quite strong. Market forces appear to be changing but it may take some time to see significant changes. Eagleview in Uwchlan Township contains a range of housing opportunities. Municipal comprehensive plans should identify the need to provide for diverse housing options as a component of their housing plans. Section 604. (4) of the Municipalities Planning Code requires that a municipality must provide for different dwelling types "for households of all income levels." This should include housing options for all the occupations needed in the municipality. The municipal comprehensive plan should also identify within its implementation strategy any revision(s) required to its ordinances necessary to meet the goals and objectives of the housing plan. Housing diversity can be achieved through a multi-directional approach that includes both new development and rehabilitation. Municipal officials may need to create partnerships with developers and funding entities to complete diverse housing projects. Developing a mix of uses with mixed-income housing, creates the opportunity for a diverse, inclusive, and vibrant community. Amendments to municipal ordinance provisions that are needed to accommodate such development could possibly be assisted by funding from Chester County's Vision Partnership Program. The Chester County Department of Community Development could provide guidance to developers regarding funding for the creation of affordable housing units. Oxford Region Multimunicipal Comprehensive Plan (comprised of Oxford Borough, and East Nottingham, Elk, Lower Oxford, Upper Oxford and West Nottingham Townships): This Plan, adopted in 2012, recognizes the need for workforce housing for the occupations needed in each municipality. The Housing Plan component recommends that the municipalities coordinate with agricultural employers and non-profit housing providers to assist low-income workers to access housing that meets building quality and occupancy standards. Honey Brook Township: The Township's Traditional Neighborhood Development Overlay District in Part 24 of the Township Zoning Ordinance encourages incentives for a mix of residential and other types of development in Rocklyn Station. Newlin Township: Section 309.C. DISCRETIONARY DENSITY BONUSES of the Newlin Township Zoning Ordinance includes a provision for encouraging "least-cost" housing. A density increase is permitted where the applicant provides on-site or off-site housing opportunities for low- or moderate-income families. West Vincent Township: West Vincent Township's Sustainability Plan includes policies that promote a variety of moderately housing opportunities and a more diverse population.